The Economic Impact Of Melbourne Cup. If I haven’t made it clear before, then let me make it clear now: I am of the belief that large scale events have little to no economic impact. I do not believe the benefits outweigh the costs. This tends to be the view of most sport economists (with a few exceptions – those who are wrong). The Melbourne Cup is no exception. Here’s why. We’ll start with the apparent benefits. The first is that the high number of visitors brings extra money to the area. There are over 120,000 international and interstate visitors to Melbourne during the event. These people pay for flights, accommodation and food. They also buy souvenirs and spend money in other local businesses. When I was studying in Sydney, a few of my American friends flew to Melbourne for the races and stayed to go on the Great Ocean Road tour as well as visit some of Melbourne’s other attractions. The people who attend the event need to look the part. I mean, show up to the event without a fascinator?! Are you crazy?! This dress code, and the desire to appear on blogs and in newspapers because of your amazing fashion sense, means there’s a lot of money spent on clothing and grooming. Almost $30 million… WHOA. Those who don’t attend the event (the majority of the nation) usually watch it on TV. These high numbers (over 95% of metropolitan residences) mean increased TV revenues, which are then spent in the Australian economy. In this case, I have to ignore the idea that increased tourism keeps locals away. I don’t buy it. Victorians love them some Melbourne Cup. If this were an issue, I would be shocked. But what about the costs? Ah, yes. The overlooked part of the economic analysis. People sometimes forget that it costs money to host an event. Especially one like this. Emirates spends over $6 million dollars on the event, which is private money. That’s a great start, because it’s essentially a private company footing the bill for all these great things to happen to the Australian economy. But it’s just a start… Melbourne has to spend the money to implement different transportation for the day including altered road rules/direction, use of public transport and security for the event. Now, I don’t know the costs of all these things, but the bottom line is that it’s not free and the money spent on it is public. Most importantly is the loss in productivity on that day. I found an article that hypothesizes that Australia loses $1 billion in productivity on race day. This is due to people taking half or full days off work, the time spent talking about/watching the event instead of working, whether work sponsored or not. I can attest: both my previous work places take time off (one takes the entire day to wine and dine – jealous!) during the Melbourne Cup. Considering the total benefits aren’t expected to be more than $728 million (gross, not net), then this is a high cost. An absurdly high cost. A cost of $650 million, if we’re being specific. Then there are aspects that are not quantifiable. Like traffic congestion, vandalism and environmental degradation. Those costs add up, especially when you consider who pays for them (the Victoria locals, that’s who). I’m also going out on a limb and saying that buying new clothes can produce a negative externality. If you would have seen my insanity at the shopping centre the day before Randwick Races trying to find a dress, you would understand. I will admit, though, that there is a seriously huge positive externality: unity. How awesome is it that nearly everyone in Australia watches this event? It’s a great thing, ain’t it? But in terms of cash, I call it a fail. It is not economically beneficial. And don’t let anyone tell you any different! What do you think? Have I made my point that it’s not beneficial? Or are you still letting Emirates convince you this is good for Australia? Thoughts? Part One: Is Israel Folau Worth $6 Million Dollars? I’m not sure why, but there’s been a bunch of articles on Israel Folau recently and all within the same vein: ‘Folau needs time to develop: Silvagni‘ – AFL.com, Paul Daffey. ‘Folau deserves a real chance with GWS‘ – The Roar, Myles. ‘Folau still learning: Sheedy‘ – The Roar, Rob Forsaith. I am going to do my best to leave my personal feelings out of this because I have so, SO many feelings. I could create a website about them. But this is the summary of the articles: Folau is playing poorly so everyone is passing judgement, but the Giants and Kevin Sheedy (good man, that Sheedy bloke) stand behind him. If nothing else, it’s a heartwarming story about teamwork. But facts are facts. And the fact is, Izzy is being paid a lot to do very little. So it’s not his stats that are the problem (they are A problem, not THE problem), it’s how much GWS is paying for them. 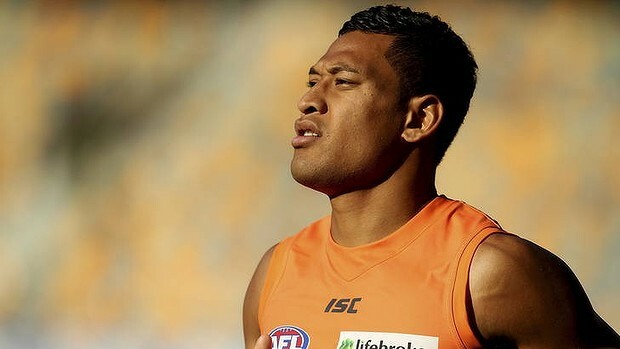 For those of you who don’t know, Folau was a professional rugby player who traded Broncos for Giants when he left Brisbane to join GWS in its first year. Although AFL salaries are not made public, he reportedly signed a deal worth $6 million over 4 years ($1.5 million per year). That’s a fair bit of coin, especially considering the average player salary is around $220,000. There’s a lot of discussion in sport about how to know what a player is worth (as I’ve previously discussed, the NBL solves this problem through its Player Points System) and how to monetize their contribution. This is where sports economics comes into play – I swear I will do my best to make this as clear and as non-economics-y as possible. Let’s start with something basic: salaries. 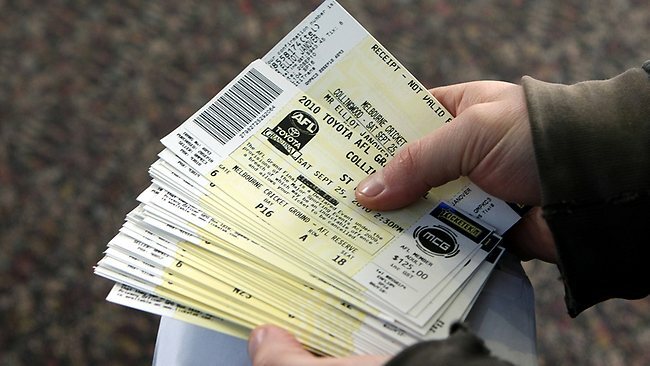 The 2011 CBA states that the base salary (with includes superannuation and pre-season matches) of a first year player, drafted in the first round is $59,200 with $2,900 additional for every senior match played. Folau is different because he qualifies for the AFL’s elite athlete rules, but let’s evaluate him as a first year player, first round draft pick. If he were a typical first year player, he would have made $99,800 this season (he might have also received a $8,100 bonus, but let’s ignore that for now) – yet, his contract gives him more than 15 times that amount. If you look at it the other way around, you realize GWS is paying him more than $100,000 per game. Given his on-field performance the argument seems pretty weak. Note: These are totals, not averages. These statistics show that Folau is being paid much more than his on-field worth. GWS could have gotten 12 more Jeremy Camerons for the price of Izzy! Okay, okay, I’ll try and ease up on the Jezza-Love…but you can see why people are questioning the decision to spend so much on him. Although Folau is a great athlete, he doesn’t know enough about the game to be a great player yet and while he might need a few years to reach his full potential, these other, younger boys have realized their potential straight away… and it didn’t cost the team $6 million dollars. I’ll spare you the rest and instead, write up a part 2 to this series… stay tuned 🙂 Oh, and if you think this is all wrong, please read my disclaimer.